The App is available for free to all who have an interest in the school and want to stay up to date with academic and extra-curricular activities. The students and their families can keep up to date with events such as after school study, match results, school policies etc. There is a dedicated section for Transition Year, for the Parents Association and for Photos and Videos. The App also provides a calendar of all important dates such as parent teacher meetings and school holidays and as it is on your phone the information is immediately accessible. 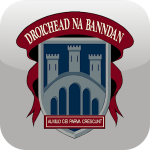 The School Smartphone App is available for free and can be downloaded from the Apple App store or from Google Play.